(August 29, Melbourne, Sri Lanka Guardian) We are living in sad times where most Tamils are feeling desperate not knowing what to do next. Each day the situation of our people is getting worse as all our hopes are crumbling before our own eyes. Our people have gone through terrible times. Our people have suffered enough. They have gone through enough. Our people have faced the worst. When the Sri Lankan Army came our people faced severe hardships. When the Indians came it was no better, When the Tigers came ….I don’t have to tell you what happened, Should we watch the suffering of our people without any hope of ending it? What is our bravery worth if it is only to demonstrate in Western capitals without gaining any positive results? Is our bravery only to fill the safe streets of Melbourne, London, New York and Paris while our streets in Mannar, Vanni and Killinochci are occupied by the Army or Tigers in uniform abducting our children? Whoever comes and goes there is no escape for our people. We argue. We go to seminars. We collect funds. We hold concerts. But where has all this taken our people? Have any of these decreased the suffering of our people? If there is some relief to our people, if there is some hope after sacrificing so much of blood and lives we can be happy knowing that our people will derive some benefit tomorrow, or the day after or even in some months. We send millions in the name of our people but they are still dependent on the hand-outs given by the Sri Lankan government. Are we not hiding our heads in the sand and believing in our illusions and not the reality? The glamour and the glory of our early struggle have disappeared. Now we are faced with only the grim suffering of our people. Our people are sick of this war. What is our duty? That is the question that the Tamils everywhere have to answer. For how long are we going to finance and find excuses for a war which cannot guarantee our separate state? Which one of us can guarantee that we can win this war? Military experts say that neither side can win this war. We do not have even the basic manpower to fight the war. It is our sick, our old and the school children who are thrown into this war, according to the UTHR report. Is this the kind of war we want? And can we win this war? Today we are facing the biggest humiliation in our history. We are on the verge of being defeated in a war that has brought no benefit to our people. Our people are forced to sacrifice their lives for what? Our people are far safer and much better off if we do not have a war. No body wants this war but we are scared to tell the world that we must end this war NOW and not later. Those who speak out against this war are attacked as being defeatists, cowards and traitors. Name calling is easy. But how is that going to help our people? We have looked the other way when our entire leadership was liquidated not by the Sri Lankan government but by our own people. We pretend not to know that our children are denied schooling and dragged out by our own people to fight in a useless, unwinnable war. We dismiss as propaganda when our own people are tortured in concentration camps. We think it’s heroic when our Tamil patients are forcibly taken from hospital beds and forced to fight in a war that has no end in sight. We laugh when our old men are scolded and pushed around by our podians for not doing guard duty properly t the war front. We can’t even go back to our homeland without paying poojas to the one-man regime that has denied our people the fundamental freedoms. Our people cannot even speak freely without fear of being arrested by the guard dogs of the Police state in the Vanni. Is this the Tamil culture we are fighting for? Today our people are trapped between the advancing Army and the retreating Tigers. Our people do not want to be trapped in the middle. Who wants to be trapped in the middle of a war? They want to find safe places. They don’t have shelter, water, medicine or even a decent roof over their heads. If the Army shells or the Tiger abductors don’t get our people the snakes come out to get them. Over 25 cases of snake bites have been reported. Who is responsible for all this? Who is to be blamed? Why is it that the majority of the Tamils prefer to live outside our homeland? How many of those who fund the misery, the deaths and the destruction of the Tamils are prepared to live in this Police state? Why are we fooling ourselves? 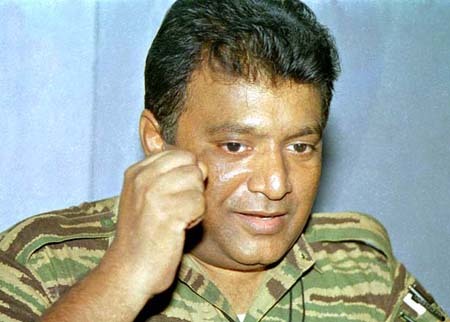 From the time I engaged in Tamil politics 25 years ago we have been blaming the Sinhala governments. I also did so. I was one of the founder and secretary for medical unit for Tamil in Chennai which was the supported by all militant organization, including LTTE, and ran a charity organization to provide free medical aid from 84 -87 The present TRO has its roots in this organization. I used to blame the Sri Lankan government when I was in these organizations. But there is a limit to blaming others for our own mistakes and follies. After immigrating to Australia I did not sever my connections with the Tamils who were facing severe hardships. I launched the bilingual news paper, Uthayam to give voice to our people. I have worked with refugees in Vavuniya, in India and in Australia. With all my experience I find that blaming others is not the answer to our problems. We have to take responsibility for our failure to look at issues critically and take responsibility in areas where we went wrong. Blaming the Sri Lankan government, India, the international community and others, as we have done throughout our history, has not saved us. The time has come to go beyond blaming outsiders for our own blunders. Our duty is to use common sense and end the war sooner than later. This can be achieved only if we make a clear choice between our politics and our people. Are we going to save our failed politics or are we going to save our people? That is the question we must answer now.. It is hypocritical for us to cry for human right when our people are not even given a choice to decide whether they should be in the middle of a war, facing unnecessary risks and sufferings, or given the choice to escape to a safe haven. How can we feel morally superior when our people are kept against their will to face a war which they don’t want? If we can’t decide between war and peace we can at least make a choice between keeping our people as prisoners in the middle of a war or letting them go. The people have a right to decide where they should stay in times of war. They cannot be kept against their will to face bullets and bombs. Let the people decide with whom they want to stay. It is time we all said: Let my people go in peace to wherever they want to go.